Jolene Perry is a middle and high school teacher turned author. She married the guy she kissed on her high school graduation night, lives in the mountains of Alaska, and has spent months sailing in the Caribbean. Her previous novels for young adults include The Summer I Found You and Has to Be Love. Sixteen-year-old Hailey Bosler has what her ophthalmologist calls“old-people eyes” (macular degeneration and glaucoma), two moms, and a position as the lead singer of a girl band. She also has a fear list, a compilation of things that she wants to conquer before she goes completely blind. After her band is interviewed at a local radio station, she bumps into the station’s sound engineer, Kyle. They engage in a mumbling conversation that ends with Kyle shuffling off and Hailey intrigued. The two run into each other a second time at a concert in a bar, where she ends the night puking on his shoes. As an apology, she buys him a new pair and convinces him to start his own fear list, and thus their story begins. Partnering up for this emotionally charged novel, Desir and Perry create a duo readers will identify with and cheer for. As the teens set out to conquer their fears, the sexual tension quickly builds, with both refusing to accept the depth of their mutual attraction. Hailey is confident, stubborn, and funny and isn’t afraid to show her sassy side. Meanwhile, Kyle is shy and awkward. The authors combine perfect pacing with spot-on character development that will leave readers empathizing with the characters from the very beginning. The plot takes several unexpected turns; it hits hard, exploring issues such as depression, loss of virginity, and homosexuality. VERDICT For fans of Sophie Kinsella’s Finding Audrey (Delacorte) and Jennifer Niven’s All the Bright Places (Knopf, both 2015). 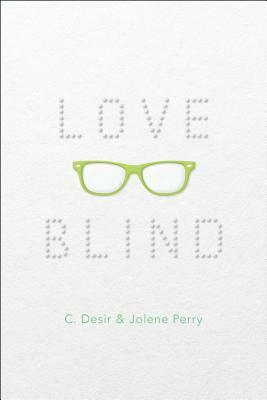 "Like Desir’s other books, [Love Blind] is forthright in its portrayal of older teens’ emotional and sexual lives. Readers who enjoyed [Desir's] earlier books will devour this latest offering, and those who love Ellen Hopkins will want to know Desir if they do not already."